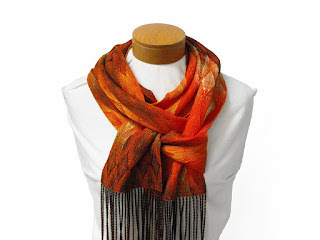 I am a little behind on my blog posts; I wove these scarves in October. But they are so pretty that I still think that they are worth a blog post. 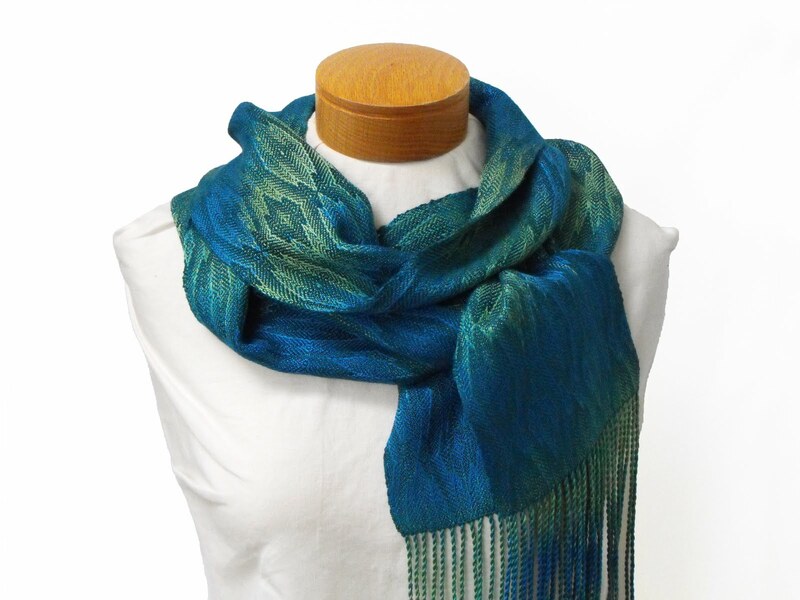 The first scarf is a hand painted silk warp, it is actually the last one from a dye day in 2016. The bottom two warps have already been woven and blogged about here. The warp is a really pretty blue and soft green. I thought that a weft for this warp would be really hard to find, but I really lucked out. I only had to try two wefts, a dark teal and a light teal. Right away I could tell that the dark teal was the winner. The pattern is a 12 Shaft fancy snowflake twill; the pointy jagged diamonds in the dark teal really highlight the shifting colours, especially the green. The finished scarf is really spectacular. The pattern definitely highlights the painted silk warp and it is one that I will use again. It has sold. 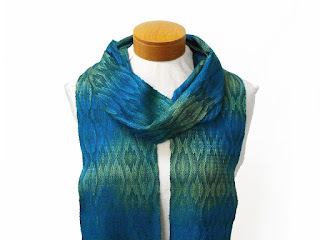 The second scarf is from the same dye day but it is a Tencel warp. We had two large cones of buttercup yellow (I don’t know why) so we pulled yellow Tencel warps to over dye. This warp was split into five stripes, and then two of the stripes were flipped before dyeing. After the warp was dyed the two stripes were flipped back and that creates the striped effect. I like to get out all the bins of Tencel so I can see every colour that we have. The bins have been separated into colour families. There is a neutral/yellow bin, a red/orange bin and not shown are the blue/green and purple bins. This warp was dyed in autumnal colours of brown, orange and gold with some of the original yellow showing through. The brown dye has broken a little and there is some green too. There is a lot of brown in the warp so picking a weft colour was a little tricky. I tried straw, gold, taupe and orange. 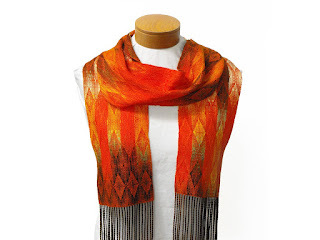 I went with the orange, I know that a lot of people hate orange but it was the best choice for the scarf. The pattern is the same tie up and treadling as the first scarf, but I changed the threading. I like to change up the threading or treadling and reuse the tie up especially when the tie up is for twelve shafts! The scarf is very bright and autumnal. It has also already been sold, but this time at my weaving guilds Christmas Sale. Final Garden Shot is the two hummingbirds that have staked out our humming bird feeder. We have two feeders and we switch them out every hour so the hummingbirds can have unfrozen food all during the daylight hours. We also bring them in at night. This week is the first cold weather we have had this winter, it is our version of the polar vortex, it is going down to -8 C but feeling like -15 C.